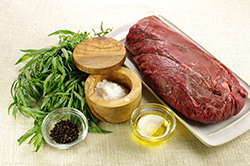 I had always cooked filet of beef at a high temperature to sear the outside and keep the inside moist and rare. 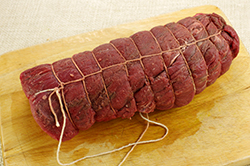 Recently, though, I tried slow-roasting a filet of beef, and found it was the tenderest I’d ever tasted. Prep it in advance and throw it in the oven two hours before dinner. 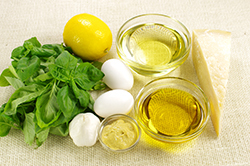 The homemade mayonnaise with basil and Parmesan is a delicious accompaniment. Preheat the oven to 275 degrees. Use an oven thermometer to be sure your oven temperature is accurate! 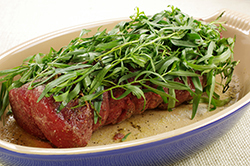 Roast the filet of beef for 1-1/4 to 1-1/2 hours, until the temperature registers 125 degrees in the center for rare and 135 degrees for medium-rare. 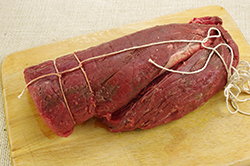 I place the thermometer horizontally through the end of the beef. 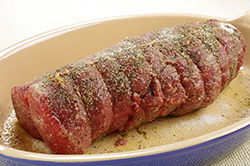 Cover the filet with aluminum foil and allow to rest for 20 minutes. 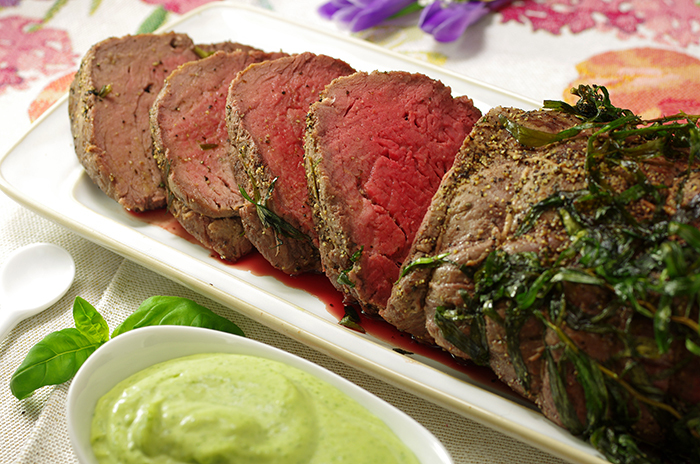 Slice thickly and serve warm or at room temperature with Basil Parmesan Mayonnaise. Homemade mayonnaise sounds intimidating but there’s really only one trick: the eggs and oil must be totally at room temperature. 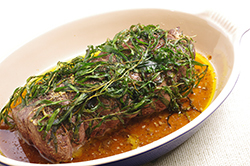 Adding fresh basil leaves and salty Parmesan cheese makes this a great sauce for filet of beef but it’s also delicious as sandwich spread, a dip for crudités, or served with a flavorful fish like salmon or swordfish. 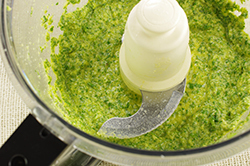 Place the egg yolks, lemon juice, Parmesan, mustard, basil, garlic, 1 tablespoon salt, and 1 teaspoon pepper in a food processor fitted with the steel blade. Process for 20 seconds, until smooth. Combine the vegetable oil and olive oil in a 2-cup liquid measuring cup. With the processor running, slowly pour the oil mixture through the feed tube to make a thick emulsion. 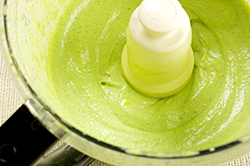 Taste for seasonings – the mayonnaise is a sauce so it should be highly seasoned. Store in the refrigerator until ready to use; it will keep for up to a week. 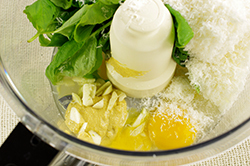 * Note: I “grate” the Parmesan in the food processor – it’s actually ground, which is better than grated.